Biking on the Danube Bike path! Need we say more. We could simply finish there. Those of you who have researched any European cycling have this on your bucket list. And this tour is epic! Through the fertile plain of the Gäuboden, with the foothills of the Bavarian Forest to your left, you cycle towards the southeast in a landscape that is perfect for cycling. 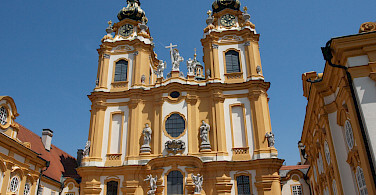 In Deggendorf, the gateway to the Bavarian Forest, you continue cycling to the three-river city of Passau, with its impressive Saint Stephan's Cathedral. It is here, you access the most famous and popular bike route in Europe, the Danube Bike Path on which you cycle through all the highlights. 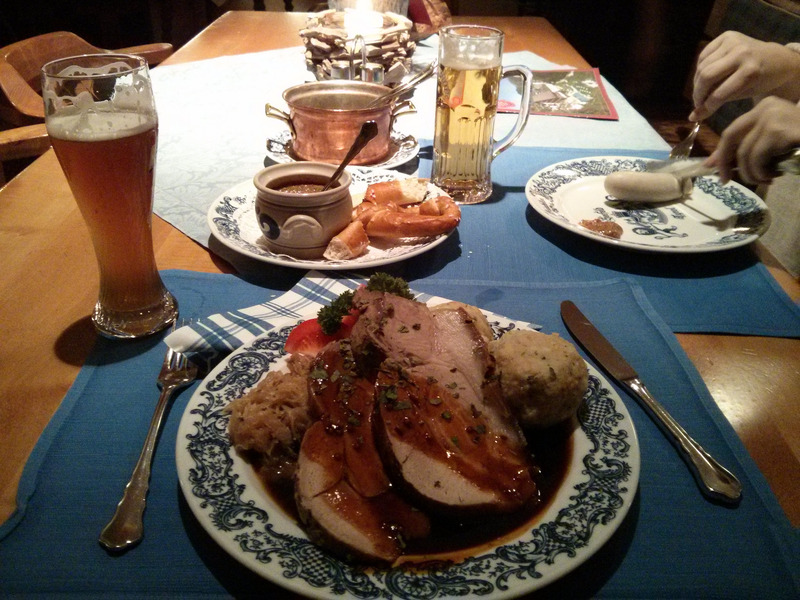 Your trip ends among the foothills of the Viennese Forest, beyond the point where the Danube passes Vienna. Interested in more? 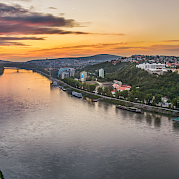 Check out our full list of Danube Bike Tours. Take the train from Munich to Regensburg HBF. Total trip time is between 1.5 and 2 hours. 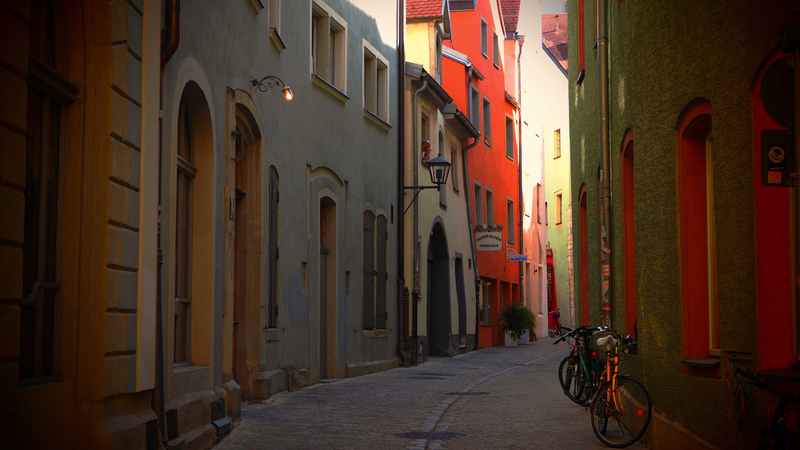 Be sure to reserve an extra night in Passau or Vienna! Accommodation in 3- and 4-star hotels, all rooms have private facilities. Breakfast included. The cycle paths of the Danube are consistently flat. You cycle primarily on asphalted roads with hardly any traffic. Individual arrival to Regensburg. 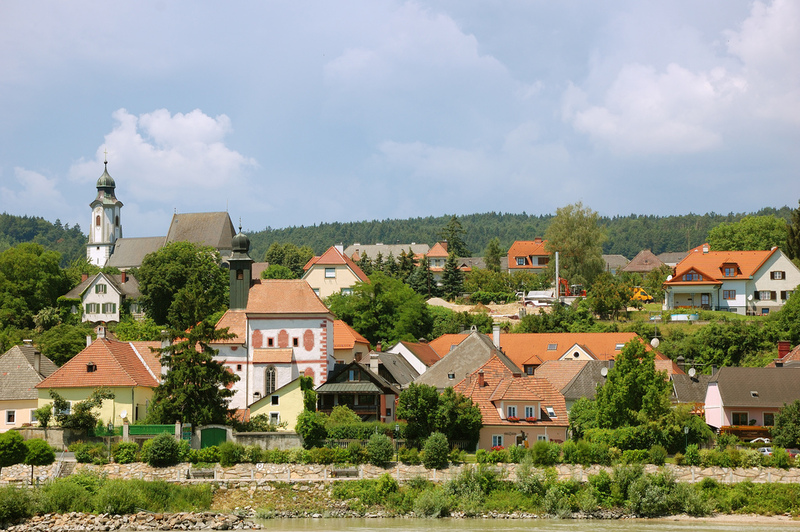 This medieval town is the perfect place to begin your bike tour along the Danube. It contains many buildings of exceptional quality that testify to its history as a trading center and to its influence on the region from the 9th century. Be sure to visit the market, city hall, and cathedral! After passing the Bridge of the Nibelungs and the “Walhalla-Allee”, you will reach the marked bike route “Tour de Baroque”, which takes you to Donaustauf. The ruins of a medieval castle, presumably erected between 914 and 930, tower above the small town. Visible from afar, the famous Walhalla, “Temple of German Honour”, rises above the Danube Valley. You continue on the Danube levy, past the Geilsing step and through the area around the Old Danube to Straubing. Today you continue to bike through Danube Valley and soon you'll arrive to Bogen beneath the steep Bogen Mountain. 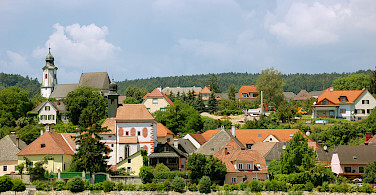 This quiet little town is one of the gates to the Bavarian Forest, where nature abounds. You will continue to Metten, where in good weather the twin towers of the church are visable. Be sure to visit the library in the Benedictine Convent and the church with its fabulous Asam paintings. You will spend the night in Deggendorf. This city is not only known for its scenic beauty; Deggendorf is home to many impressive monuments which are sure to suprise you! Today's route once again follows the “Tour de Baroque”. 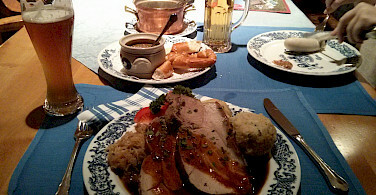 Via Niederaltaich, one of Bavaria’s oldest Benedictine convents, you will reach the small town of Winzer. The view over the Danube Valley from the old castle ruin is amazing. After passing through Osterhofen, there is a short hilly section before reaching the water power plant Kachelt. After crossing the Danube, you will arrive to a city sure to be a highlight of the trip: Passau. 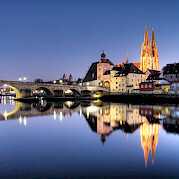 Located at the confluence of the rivers Danube, Inn and Ilz, Passau is known around the world as "The Three Rivers City". In the heart of the city, on the Old Town’s highest point, sits St. Stephen’s Cathedral, in which the world’s largest cathedral organ is still played. 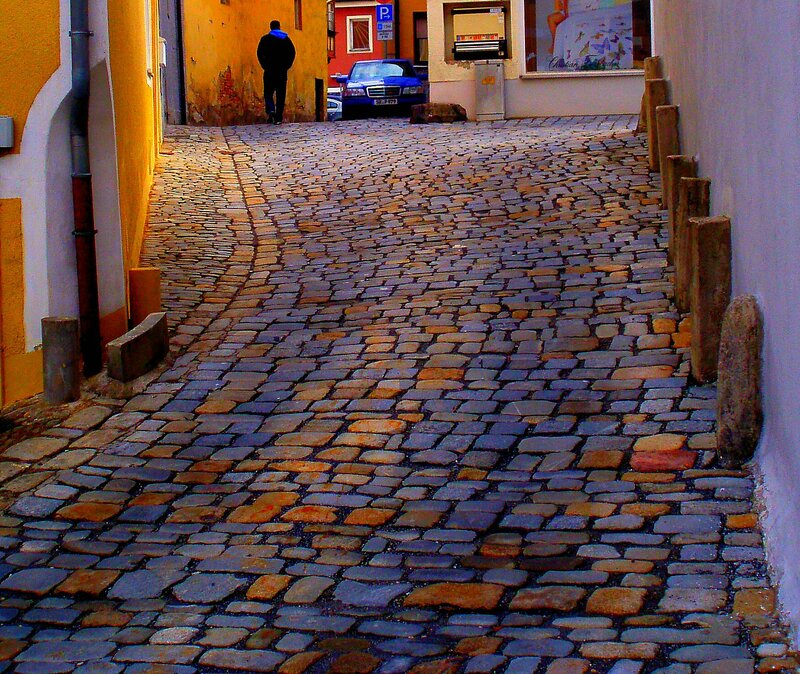 With its unique charm and friendly atmosphere, Passau is one of the most beautiful and spectacular German cities on the Danube. Today you cycle to the Upper Danube Valley. From Passau, you can also organize a boat trip to today's destination. 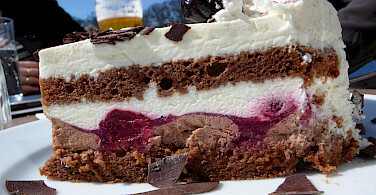 The first scenic highlight is the Schlögener Donauschlinge or the Danube Loop. This is where the river makes a hairpin turn and curves back on itself before returning once again to flow eastward. At Aschach the valley stretches before you. You'll cycle through Eferdinger Becken, before reaching Linz. Named a UNESCO City of Media Arts, Linz has plenty to offer. There are lots of Baroque buildings to explore including the former town hall, Altes Rathaus and the old cathedral or Alter Dom. The riverside Lentos Kunstmuseum Linz has a major modern art collection. Across the river, the striking Ars Electronica Center focuses on society, technology and life in the future. 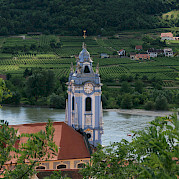 From Linz, you will pass through even more scenic villages. In Mauthausen, you'll get a taste of WWII history with the KZ-momorial. 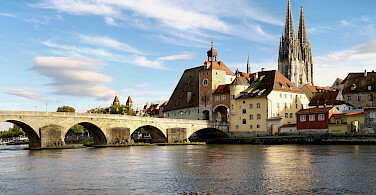 Finally in Grein, be sure to visit the Greinburg castle, the town theater, and the maritime museum. 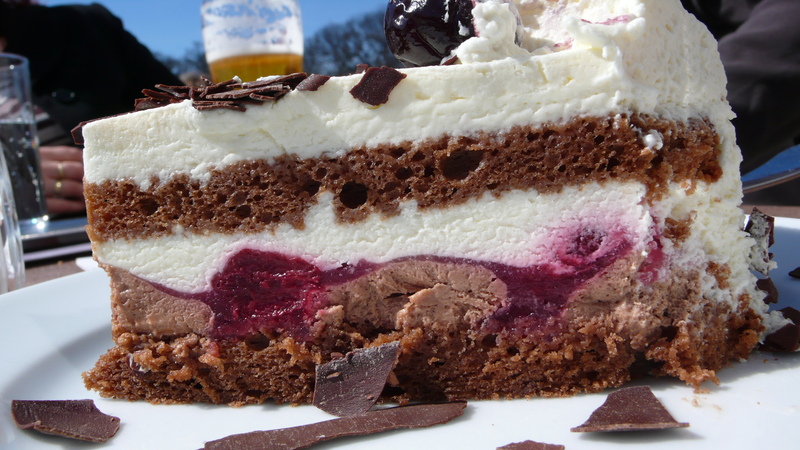 Leaving Grein, you'll cycle from the romantic Strudengau to the town of Ybbs. During the Roman Empire, a group of Egyptians lived here and built a temple dedicated to a popular goddess. Also starting here is the gentle landscape of the Nibelungengau. From far away, you will see the pilgrimage church of Maria Taferl, which is located above the Danube Valley. Don’t miss the famous Benedictine Abbey, a lovely building in a unique location. Today you get to enjoy one of the most beautiful stretches of the entire tour. Natural beauty has created a picturesque cultural landscape. You will bike past lush vineyards on rolling, terraced hills and through extensive apricot orchards. 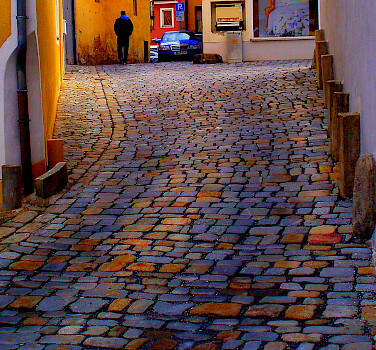 The small wine towns beside the Danube are particularly charming. 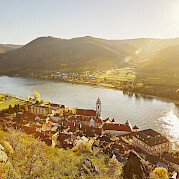 You will visit Spitz, Weißenkirchen, and Dürnstein. Don’t forget to try the local Riesling and Grüner Veltliner Wines. The countryside changes and you reach the wide meadows of the Tullnerfeld. To the south you will see the mighty Benedictine Abbey of Göttweig. 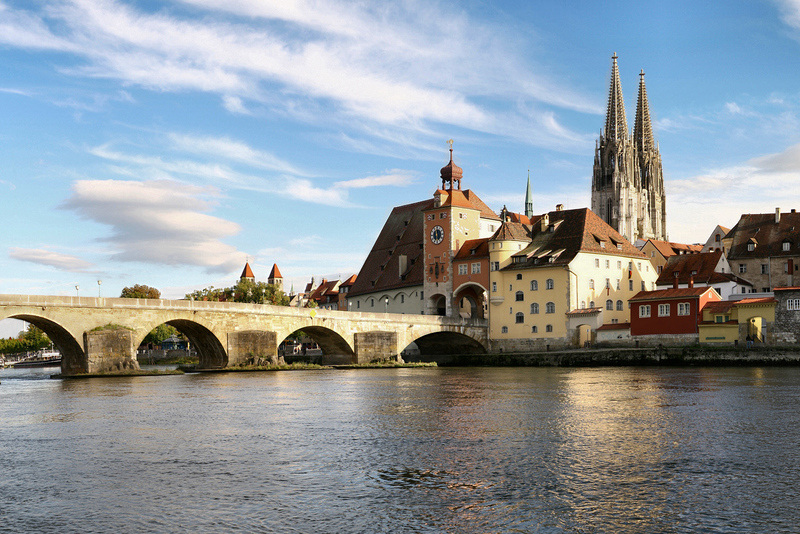 You will spend the night in Traismauer or Tulln, which are both known for their beautiful flowers. You will spend your last cycling morning biking through the foothills of the Viennese Forest before reaching the gorgous city of Vienna. You can take a train for the last few kilometers (trains leave every half hour from Tulln to Vienna; not included in the package price). This city's artistic and intellectual legacy was shaped by residents including Mozart, Beethoven and Sigmund Freud. The city is also known for its Imperial palaces, including Schönbrunn, the Habsburgs’ summer residence. 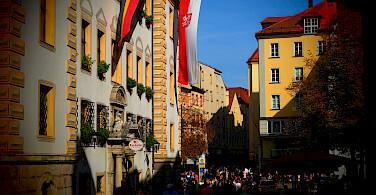 In the MuseumsQuartier district, historic and contemporary buildings display works by Egon Schiele, Gustav Klimt and other artists. This tour is run by Austria-Radreisen.